Fundraiser by Dahkota Brown : Funds to keep us going! Funds to keep us going! Amador Community Foundation and are 'Tax Deductible' !! The mission of NERDS is to support the peer-to-peer mentoring clubs currently in place, that focus on education, culture, and community service. 100% of NERDS participants have reported NERDS being a positive influence in their lives. Our programming includes high school mentoring to support education & emotional health, + we are now open to all age cultural gatherings, and engagement with positive, sober, and educated role models. A great majority of NERDS students are living with situations that label us “at-risk” and often create obsticles preventing admission to college or being employed. We provide them the opportunity to remain in school, succeed, graduate and assist them in plans for their future. After 6 years of growth and invitations to create NERDS groups nationwide, we've decided to shift our focus from growing NERDS to EMPOWERMENT of Natives across North America! Dahkota Brown, along with his brother Dahlton, have begun working with youth groups across the country to spread the mission of NERDS, while motivating Native youth of all backgrounds to seek leadership opportunities in their community and school settings. While we will continue direct services to the NERDS groups of Amador County, where we call home, we will now focus on using the NERDS name, logo, and mission statement to empower Native youth no matter where they live! We hope to use NERDS as a “rallying cry” to call attention to the plight of Native youth, while also encouraging Native youth to help fix the problems they see affecting their lives. Please help the Native students in NERDS reach a brighter future and see that people believe in them because without Your generous donations, we can't provide the services the children desperately need! Help us collect $10,000 to run our Summer School 2018!! Students in need more than ever before with less options for making up credits. With funding, we will succeed in helping all of them with the opportunity to graduate on time, with their own class, from their own school! Without your support and sharing the cause with friends, family, employers and other organizations that may want to sponsor us, we would be have to cancel the youth gathering. We have applied for every Native youth grant we can find and even though I have been on numerous panels for Native Americans in Philanthropy, when we apply, we are told NO... and we have applied to them all. We have the current Gen I pending which would be huge at $5k.. we also have the Nike 7th Generation grant for $10k pending but at this time without a quick $2600.00k we are in a panic about moving forward with the event. Thank you for sharing this & all of your support in the past. It means the world to many of us!! 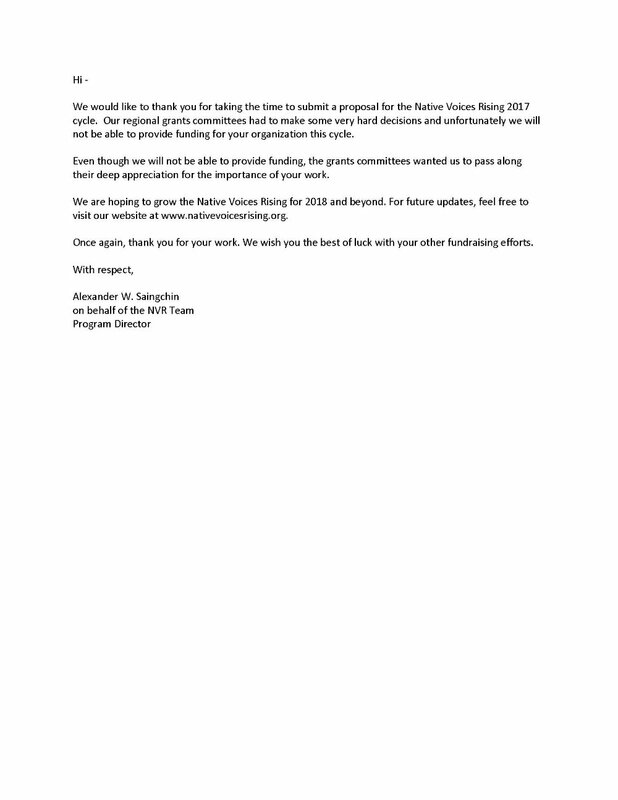 Applying to all grants but always a "no"
NERDS will host the 5th annual gathering but we are in desperate need of raising $12,500.00 to make it happen! Sponsorship opportunities are available for Tribes and Businesses if you can help!! Please share far & wide. The kids can't miss a field trip!